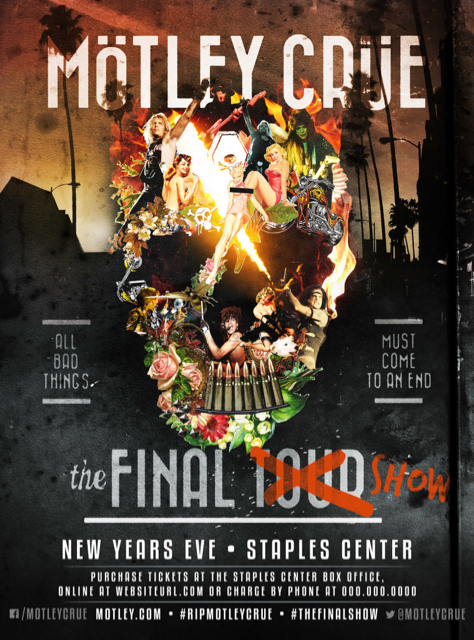 Motley Crue wrapped up their farewell tour on New Year’s Eve at the Staples Center in Los Angeles. Bassist Nikki Sixx and singer Vince Neil both offered extended goodbyes to fans and Tommy Lee’s drum set stalled on the roller coaster during his “Cruecify” drum solo as the Crue delivered their greatest hits set to a sold-out crowd. The event was filmed by director Christian Lamb for a theatre and Pay-Per-View release later this year. The project will also include interviews and behind the scenes footage captured during the final week of the tour, with footage shot by Jackass creator Jeff Tremaine. 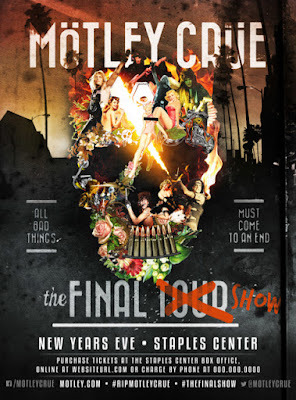 Motley Crue announced the farewell run at a January 28, 2014 press conference in Hollywood, and signed a binding legal document known as a "cessation of touring" contract which prevents them from touring beyond 2015.